The second event of primary importance during Constantine's reign, next to the recognition of Christianity, was the foundation of a new capital on the European shore of the Bosporus, at its entrance to the Propontis (Sea of Marmara), on the site of the former Megarian colony, Byzantium (Βυζάντιον). Long before Constantine the ancients had been fully aware of the strategic and commercial advantages of Byzantium, situated as it was on the border of Asia and Europe, commanding the entrance to two seas, the Black and the Mediterranean. It was also close to the main sources of the glorious ancient cultures. Judging by the sources, in the first half of the seventh century B.C. 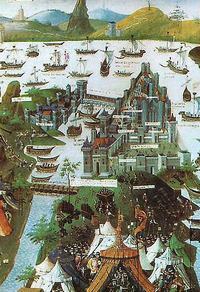 the Megarians had founded a colony named Chalcedon, on the Asiatic shore of the southern end of the Bosporus, opposite the site where Constantinople was built in later years. A few years after the founding of this colony another party of Megarians established a colony on the European shore of the south end of the Bosporus, Byzantium, named for the chief of the Megarian expedition, Byzas (Βύζας). The advantages of Byzantium over Chalcedon were well understood by the ancients. The Greek historian of the fifth century, B.C., Herodotus (iv, 144) wrote that the Persian general, Megabazus, upon arriving at Byzantium, called the inhabitants of Chalcedon blind people, because, having a choice of sites for their city, they had chosen the worse of the two, disregarding the better site, where Byzantium was founded within a few years. Later literary tradition, including Strabo (vii, 6, c. 320) and the Roman historian, Tacitus (Ann. xii, 63), ascribes this statement of Megabazus, in a slightly modified form, to the Pythian Apollo who, in answer to the Megarians question as to where they should build the city, answered that they should settle opposite the land of the blind. Byzantium played an important part during the epoch of the Greco-Persian Wars and the time of Philip of Macedon. The Greek historian of the second century B.C., Polybius, analyzed thoroughly the political and economic position of Byzantium. Recognizing the importance of trade relations between Greece and the cities along the Black Sea, he wrote that without the consent of the inhabitants of Byzantium not a single commercial vessel could enter or leave the Black Sea and that the Byzantians thus controlled all the indispensable products of the Pontus.